A school has banned children from taking pencil cases into class in case they are used to hide sharp weapons. 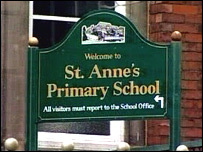 St Anne's Primary School in Denton, Greater Manchester, acted after a boy was cut with a letter opener by a pupil who had hidden it in a pencil case. The nine-year-old boy suffered minor cuts to his chest and leg when he was involved in what the school say was "boisterous play". The ban has been branded "ridiculous" and "extreme" by education campaigners. The boy who carried out the attack has been suspended until Easter. Glenys Dyer, head teacher at St Anne's, said: "We have banned all pupils from bringing pencil cases and their contents into school to prevent any other potentially harmful instruments being brought into the classroom." She said the decision to exclude the child sent "a clear message to both the child and the school community that this is unacceptable behaviour which we take very seriously." Ms Dyer added: "It was a boisterous play between two friends which got out of hand as a consequence of involving a letter opener which had inadvertently been brought into school in a pencil case by another child, and we believe there were no malicious intentions." But Nick Seaton, chairman of the Campaign for Real Education, has criticised the school's ban. He said: "Most parents will think it is ridiculous to ban pencil cases just because one child carries a letter opener in his. "It seems a bit extreme. Serious action should be taken against the particular individual, but to ban pencil cases universally is silly." A National Union of Teachers spokesman said he "sympathised" with the head teacher, but added: "Whether or not the banning of pencil cases is the right answer I'm really not sure at this stage."